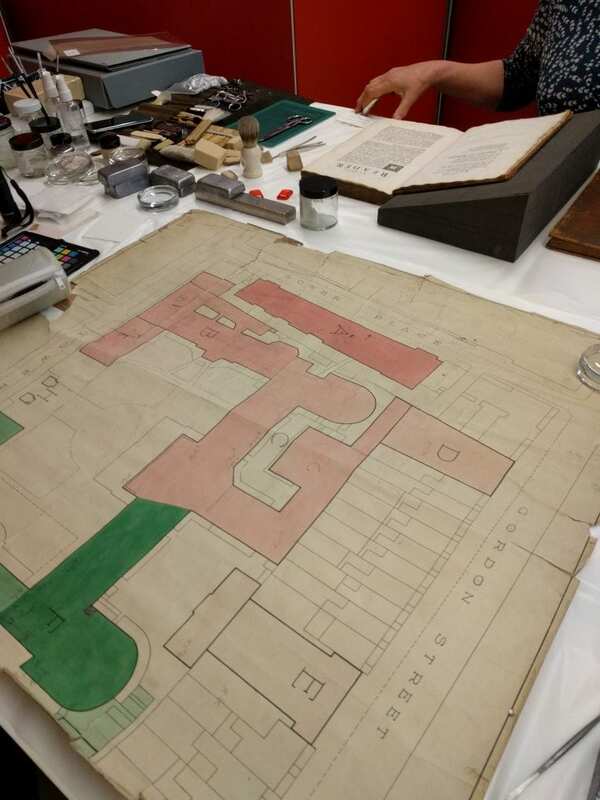 UCL Special Collections have been busy putting together an exhibition that combines items from the Main Library exhibition East Side Stories and Newham Borough’s own archival items. 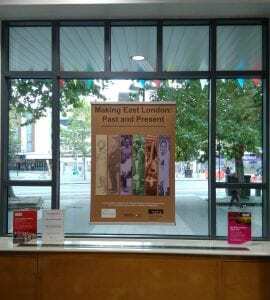 This ‘pop-up’ exhibition features historic photographs, archival documents, maps and rare publications that tell of East London’s rich and fascinating past. 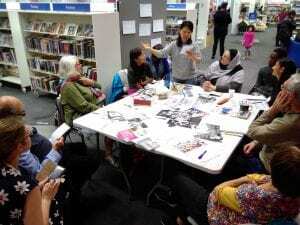 As the banners tour all of Newham’s 10 public libraries, we’ll be running a range of different workshops to deepen engagement and to create opportunities to record local people’s oral histories. Many of these activities will take place in Newham Heritage Week. We’ve kicked things off with three poetry workshops in Stratford and East Ham libraries. These groups are already well established and participants enjoy writing poetry in an inclusive and positive environment. 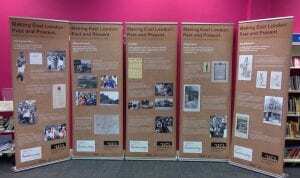 They were keen to engage with the forthcoming exhibition and the archival items we brought to them. Poems ranged from sombre, thoughtful pieces about racial tensions and migration, to playful tales of the quintessential cup of tea at a Newham street party in the 1920s. The oral histories we record will be the beginning of a new initiative, the London Memory Archive, which will be part of UCL East’s Culture Lab. It’s a timely opportunity to start developing a collection that reflects the memories and perspectives of a local community that UCL will soon be neighbour to. To support the project, and to help lay the foundations for a longer term relationship with Newham and its library and archive services, we’ve sought external funding. We are pleased to announce that we have been successful in a UCL Culture Beacon Bursary grant and a Heritage Lottery Fund grant. This means that we are able to buy the equipment needed to make archival quality recordings, receive specialist oral history training, pay for the printing of the exhibition and promotional material and all workshop resources, as well as support volunteers’ involvement throughout. We hope that we will be able to collaborate with Newham in further touring exhibitions that make use of the research and digitisation that takes place for the Main Library exhibition and also gives us a chance to bring a different edge to the narrative told. Newham has an incredible collection of historic photographs, for example, which often bring the content of an item from UCL’s collection to life. Be sure to check back for further updates and photographs of Special Collection’s outreach work! Despite the weather doing its very best to soak visitors, staff, and precious manuscripts, this year’s Treasures Day, Treasures of the Written Word, was a complete success. After shedding their dripping coats, brollies and bags, guests were treated to a range of delights, with 20 different displays on show throughout the afternoon, as well as a live demonstration of SCAR’s conservation work. Visitors came from as far afield as Newcastle, and as close as the security desk at the front of the Roberts Building. Some popped in as they passed us on their way to another Festival of Culture event and some came back repeatedly to make sure they got a chance to see everything on display. One guest even brought with him his own 17th Century German astronomical manuscript, for which he received an expert opinion from a Warburg professor who also happened to be visiting our event at the time. Popular exhibits included a 16th Century Italian Mahzor from our Hebrew and Jewish Collections, and the 1966 issue of the multimedia magazine Aspen edited by none other than Andy Warhol, held in our Little Magazines collection. But given that a live reading of 1984 was running concurrently at Senate House, it’s probably not surprising that the most in-demand item was George Orwell’s notebook containing manuscript notes for the novel Nineteen Eighty-Four. Our collections may be largely historical, but that doesn’t mean we didn’t have anything new on show. Dr Tim Causer, Senior Research Associate at the Bentham Project in UCL’s Faculty of Laws, has just had his first book launched by UCL Press. His edition of Memorandoms by James Martin, drawn from manuscripts held in the Bentham collection, challenges the myths and fictions around the earliest Australian convict narrative. For Treasures Day, Tim joined us to show his own opus next to the original manuscripts he used in his work. Memorandoms by James Martin is now available at UCL Press as a paperback, hardback, or free Open Access pdf download. As a member of SCAR I, of course, don’t have any favourites among our collections, but I was immediately enamoured with the brief note from the great composer Ludwig Beethoven we had on display. It doesn’t offer great insight into his compositions, but does give some insight into his taste in fish, as he instructs his “Kitchen Procurator” that “decent pike … alone is to be preferred to all the rest” before asking about the price of the local farm butter. A huge thanks to everyone who braved the storm to come and see us, to all the UCL staff who helped us run the event, and especially to Tabitha Tuckett, Rare Books Librarian: Academic Support and Events, for the amazing job she did in organising and delivering another successful Treasures Day. 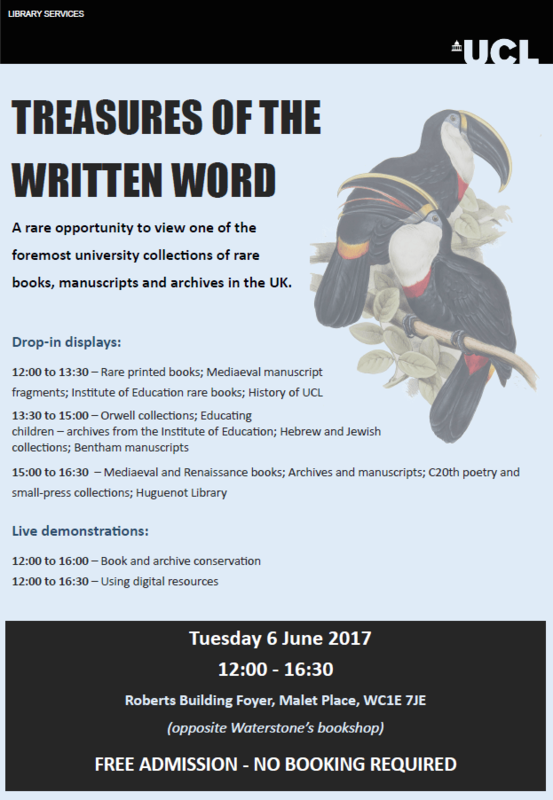 You are warmly invited to this year’s Treasures Of The Written Word on Tuesday 6 June, 12 to 4.30pm, in the Roberts Building Foyer. The event is open to all, and booking is not required: just drop in. This annual event is a chance to see some of the treasures held in the library’s Special Collections, Archives and Records, and to talk to the staff who work with them. This year we’ll also have students and volunteers talking about their Connected Curriculum projects with the collections, and our popular conservation demonstrations. See below for the full programme. Highlights will include a letter by Beethoven, George Orwell’s notes for his novel 1984, miniature children’s books from the 1700s, one of the first printed anatomy text books with pop-up diagram from the C16th, illuminated Mediaeval manuscripts in Hebrew and Latin, some of the earliest European music notation to survive, model furniture belonging to archives on the history of school education, documents on the history of UCL itself, radical design from rare C20th magazines, newly discovered Bentham manuscripts describing a dramatic prisoners’ escape, and selections from the fascinating Huguenot Library. You’ll also be able during the first session to ask our students to look up your favourite words in early dictionaries, or find out whether your favourite area of London was anything more than fields in our C18th London maps. In the second session you can have a go at transcribing Jeremy Bentham’s handwriting, or at other times during the event hear how digitising rare materials can aid research. Special Collections, Archives and Records team. One of the annual highlights of SCAR’s outreach work is our participation in First Story’s Creative Writing Day, which this year saw almost 100 pupils from six London schools descend upon UCL’s museums and library collections to attend workshops run by professional writers. 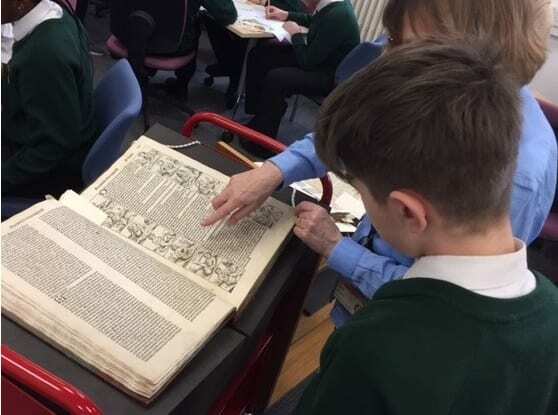 In late February, poet Miriam Nash ran a session for 17 students from St Mary’s and St John’s CE School, exploring how books interact with our five senses, and inspiring participants to create new pieces of writing based on their interactions with rare books and manuscripts from Special Collections. While the books on offer included Hooke’s Micrographia and an emblem book formerly owned by Ben Jonson, it was the 1493 Liber chronicarum which really caught the visitors’ attention. Better known as the Nuremberg Chronicle, the encyclopaedia-like book mingles legend, religion and fact to present a historical narrative which is very different from any that we’re familiar with today. This led students to pose the philosophical question: was the writer of the Nuremberg Chronicle lying, if he really believed the myths he wrote about were true? It was easy to be impressed with what the pupils produced: stories about strange creatures with feet for heads, poetry offering soberingly mature love advice, and writing that went into microscopic details. While the day may have aimed to motivate young people with objects they had never seen before, the talent and intelligence of these young authors was in itself inspiring to the library staff in attendance. First Story works to nurture the creative writing skills of young people by linking schools in low-income areas with professional writers, to help pupils discover and foster their talents. There will be an opportunity to see some of UCL’s rare editions of Dante’s works, and hear the Rare-Books Librarian talk about the history of the poet’s work in print, on Monday 27 March, 5.30-6.30pm, in the Common Room of the Warburg Institute in Woburn Square (immediately south of Gordon Square). The event will continue 6.30-7.45pm in the Institute’s Lecture Room with readings from the text and discussions from UCL’s Professor John Took and the Warburg’s Dr. Alessandro Scafi. Want to know more about who Dante was and why his writings are important for us today? Try the weekly Dante readings on Monday evenings at the Warburg Institute or fortnightly talks on Tuesday evenings at the Italian Cultural Institute. The readings on Monday 27th will feature the moving passage in which Dante and Virgil emerge from the abyss of Hell on the shore of Mount Purgatory, leaving you, we hope, in an improved mood for the holidays, albeit on a cliff-hanger until readings recommence next term. The Tuesday talk on the 28th will be on the relation between Dante, Classical mythology and Islam. Best wishes from the UCL Special Collections Team, UCL Italian and The Warburg Institute.